Nkechi S. Owoo is a Senior Lecturer at the Department of Economics, University of Ghana. Her research focuses on spatial and demographic economics in developing economies. Development economists focus significant attention on several dimensions of inequality, and how it relates to over-all economic progress. Research presented at CSAE 2019 touched on both income inequality and intra-household issues, highlighting many challenges as well as some policy avenues that have the potential to close those gaps. Anna Josephson is an assistant professor of agricultural and resource economics at the University of Arizona. Labor economics is generally concerned with the patterns of income, employment, and wages, viewed through the lens of employers, markets, or employees themselves. At the CSAE 2019 conference on African economic development at Oxford, many sessions on labor, explored this latter category, discussing those looking for work and their circumstances. This, naturally, emphasized human capital and its development. To complement these sessions, I also attended a number of presentations on households, which also had an eye to individuals within a household. These are four of my takeaways from the three days in Oxford. A number of papers dug into this idea, including papers which explored issues matching worker qualifications with firm needs (including work from Eliana Carranza, Robert Garlick, Kate Orkin, and Neil Rankin, as well as from Girum Abebe, Stefano Caria, Marcel Fafchamps, Paolo Falco, Simon Franklin, Simon Quinn, and Forhad Shilpi). Other work turned the view and considered this subject from the perspective of children: Patricia Espinoza Revollo and Catherine Porter explored trends in children’s labor, finding that factors including ethnicity, location, and household poverty influence the number of hours spent working, for children at age 8 and age 15. The economics literature has long explored households as unitary (operating as a single unit) or collective (operating as multiple individuals, within a single unit) groups. However, both of these models conceive of a world with little collaboration and abstract away from the fact that people within a household interact among each other. Recent work suggests this is changing. Tanguy Bernard, Cheryl Doss, Melissa Hidrobo, Jessica Hoel, Caitlin Kieran explore household structures and decision making, expanding our understanding of the household decision making process, and thus women’s empowerment and intrahousehold bargaining. Ben D’Exelle and Charlotte Ringdal investigate the cognitive burden of decision making and find that husbands often decide what decisions can be delegated to his wife – rather than her taking on specific decisions within the household. Both of these papers change the typical economic conception of the household and suggest our understanding of households is expanding. Although we are all generally familiar with how online social networks, like Facebook and Twitter, function, we are still very much learning how networks in the real world operate and influence us. New work from A. Stefano Caria and Julien Labonne suggests that (real-life) social networks shape our labor markets and the work that we do and, in fact, may further influence wages. The authors find that these conclusions point to the existence of a labor market dividend of social diversity. This is extended further in work from Quynh Hoang, Laure Pasquier-Doumer, and Camille Saint Macary who find that inequalities among ethnic groups are sometimes rooted in the cultural and social distances between these groups. Decisions we make are not always our own. As observed by Louise Fox, in an exploration of youth labor in rural areas: decisions of youth within a household are not necessarily the youth’s choice – but rather of the household more broadly. This idea, that our choices are deeply connected to those of others with whom we interact, was repeated across sessions: in the presentation from Cheryl Doss in talking about women and men within a household, and by Stefano Caria in speaking about understanding labor market participation. The choices made by one can influence the choices of the many. Heidi Kaila is a Post-Doctoral Fellow at Cornell University, and a Co-Editor of EconThatMatters. Jeffrey Bloem is a Ph.D. candidate in Applied Economics at the University of Minnesota. The recent CSAE conference, an annual conference on the economic development in Africa organized at Oxford included great new conflict research, which examines both the causes and the consequences of conflict. In addition to political violence and war, the presented papers also examined household exposure to violence both in terms of victimization of the household as well as intimate partner violence (IPV). A smaller subset of papers also looked at government programs and conflict. Finally, we noticed that the ACLED database is widely used when studying political conflict in Africa. Many of the papers on the causes of conflict focus on understanding what fuels conflict around the world so that efforts to limit the prevalence of conflict can be more effective. Jeffrey Bloem investigates the impact of the Dodd-Frank Act in the Democratic Republic of Congo (DRC) and surrounding countries. He finds that although the legislation aims to reduce conflict fueled through the international trade of “conflict minerals,” the policy may have backfired within the DRC and failed to reduce conflict across all covered countries. This effect may be driven by a shock to the mineral labor market due to a sharp decrease in the international trade of specific minerals mined in the DRC. Focusing more specifically on different types of mineral mines and conflict in the DRC, Majike Verpoorten finds that the relationship between mineral mines and conflict is much stronger for artisanal mines than for industrial mines. This may be because industrial mining companies can pay for their own security. These findings suggest a need to refine existing theories about the relationship between minerals and conflict with more locally validated nuance. Using leaked personnel data from Daesh (also known as ISIS/ISIL) recruits Clement Joubert examines the factors that lead to terrorist recruitment. Particularly for countries close to Syria, the lack of economic opportunities—measured as the unemployment rate disaggregated by country and education level—explains enrollment in terrorist organizations. More generally, Olivier Sterck re-visits previous research suggesting that more closely related populations are more prone to engage in conflict with each other. Re-analyzing this previous analysis suggests that that relationship may be spurious and an artifact of omitted variable bias. Importantly, it seems that the presence of a few “imperialist” countries largely explain the previously observed relationship. The papers looking at consequences of conflict were mostly focused on households in conflict. In the case of Nigeria, Neha Hui finds that domestic violence increased in areas that experience higher levels of political violence, such as Boko Haram attacks. Also in Nigeria, Heidi Kaila finds that household victimization, particularly property crimes and crimes perpetrated by insurgents, led to lower consumption and higher food insecurity. Events perpetrated by organized groups, particularly insurgents, were more detrimental than those by other actors. Hannah Sam, studying household welfare, finds that households located in areas which experienced a higher intensity of the Sierra Leone civil war had lower per capita expenditure levels immediately after the civil war, although these differences disappear over the following years. Children in the households affected by conflict can be the most vulnerable because events in early life might have long term impacts. Using data from Chad, Soazic Elise Wang Sonne finds that the exposure to local conflict in a child’s first 5 years of life leads to stunting, wasting, and being underweight, which is found to operate through reduced access to health care. While most of the conflict presentations focused on households and individuals, Michel Armel Ndayikeza provided a macro perspective. Ndayikeza estimates the economic costs of the civil war in Burundi and finds that the conflict reduced economic growth by an average of 4 percentage points per year Between 1993 and 2003, the civil war cost each Burundian between $1,200 and $1,600 and between $8 to $10 billion for the entire country. Finally, the consequences of conflict are also psychological. Using a lab-in-the-field experiment in Northern Uganda, Benedict Makanga finds that on average armed conflict did not influence trust among the participants, but among participants that had been abductees at a young age trust was lower. Using data from a large employment RCT in post-conflict Cote d’Ivoire, Assi José Carlos Kimou finds that in the long term the program increased the likelihood to attend community meetings and trust in family members and colleagues. Two studies showed that an unconditional cash transfer can reduce intimate partner violence. Using evidence from Ghana, Elsa Valli finds stronger effects among monogamous than polygamous households. Johannes Haushofer conducted an RCT in Kenya finding that the transfer reduced physical violence regardless of whether the transfer was given to women or to men. However, sexual violence only reduced when the cash transfer was given to the woman. The measurement of conflict and violence is challenging for multiple reasons. Measuring the experience of violence and in particular intimate partner violence, is hard as culture and trust to enumerators might influence what gets reported. Claire Cullen showed evidence of underreporting intimate partner violence in the contexts of Nigeria and Rwanda. Due to measurement issues, the available high-quality datasets are used extensively. A common source of data on political conflict in at least five papers at the CSAE is the ACLED database. ACLED collects information on newspaper reports on events related to political conflict and fatalities and provides geocoordinates of the events. Information on the perpetrators is almost non-existent. While information on the perpetrator can be collected from the victims (such as in Kaila using telephone survey data on Nigeria), information provided by perpetrators themselves is almost impossible to collect: The data on the DAESH foreign fighters used by Joubert are believed to have been leaked by a defector. Information on the perpetrators can be used to study the motivation behind violence and conflict and can eventually lead to policy recommendations for preventive policies. Heidi Kaila is a Post-Doctoral Fellow at Cornell University, and a Co-Editor of EconThatMatters. Saurabh Singhal is a Lecturer at Lancaster University and Divya Tuteja is an Assistant Professor at the Indian Institute of Foreign Trade. Implementing development programs in conflict-affected areas is crucial for conflict as well as poverty reduction. The big question is how do you carry out these programs successfully? Are there specific conditions under which development policies are effective? What is their impact on violence? So far, evidence on whether development policies can reduce violence is mixed. Iraq is an example of where they have been successful, but in the Philippines violence has increased, possibly due to insurgents sabotaging government programs. Therefore, a sufficient level of security could be a precondition for development programs to work in conflict areas. Indeed, evidence from Iraq and Afghanistan support this idea. To test the hypothesis further, we looked at the Indian state of Jammu and Kashmir (J&K) and examined the factors that have been related to reduced violence in the area. The low intensity conflict is rooted in the dispute between India and Pakistan over the territory of Kashmir, which began with the partition of the Indian subcontinent in 1947. The dispute has led to two open wars, in 1947 and 1965, and brought the two countries close to war on several occasions. The current armed insurgency started in 1989 in the Kashmir Valley, spreading over time to other parts of the state. The insurgency has been kept alive by support from Pakistan in the form of arms and training, while the Indian army runs a counter-insurgency operation together with the police forces. Between 1998 and 2014, it is estimated that the insurgency resulted in over 25,000 deaths. Violence has however been decreasing since the early 2000’s. 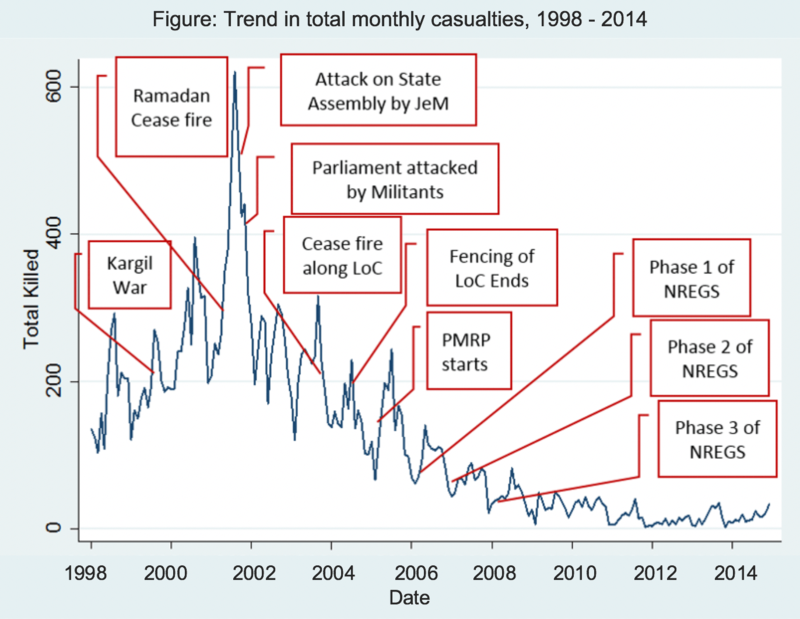 So why has violence in J&K decreased? We used information collected from newspaper reports by the South Asian Terrorism Portal (SATP) on insurgent, civilian and security personnel casualties and the number of incidents involving explosives as indicators of violence. Visualizing the data of total casualties in a graph (see figure), it does appear like there was a gradual shift from a ‘high violence regime’ to a ‘low violence regime’, a pattern that is visible for all the violence indicators. We wanted to confirm whether this was the case and used non-linear time-series techniques to precisely detect structural breaks in the violence data. Using these techniques, we found that there has indeed been two ‘regimes’ of violence: a high violence regime between 1998 and 2003 and a low violence regime between 2007 and 2014. The period in between, from 2003 to 2006, can be seen as a transition period between the regimes, during which a “smoothed” structural break took place. The methods we used allow ‘the data speak for itself’ to inform us when critical changes in violence took place instead of testing whether certain events are associated with breaks in the time series. Knowing when structural breaks have occurred is important as they often occur as a consequence of changes in policy. Having identified 2003-2007 as the crucial period during which there was a shift in regimes, we then asked the question: what policies were implemented during this period? Line of control (LoC) – The de facto border between India and Pakistan. The JaisheMohammed (JeM) – A group that has carried out terrorist attacks in the region. What happened in Kashmir between 2003 and 2006? In 2003, at the beginning of the transition period, India and Pakistan agreed to a cease-fire along their border and restored diplomatic dialogue (suspended since the 1999 Kargil war). The construction of a 550-kilometer-long border fence between J&K and Pakistan was completed in September 2004. Indian security forces estimate that it has been successful in reducing the infiltration of insurgents from Pakistan. The Prime Minister’s Reconstruction Plan for J&K (PMRP) began in March 2005. Implemented by the then Prime Minister of India, Dr Manmohan Singh, its objective was the long-term development of the state building infrastructure, providing basic services and creating jobs. As of March 2014, over 13 billion USD (780 billion Rupees) had been disbursed. The roll-out of the National Rural Employment Guarantee Scheme (NREGS) to J&K started in 2006, at the later stage of the transition period. Being one of the largest safety net programs in the world, NREGS guarantees 100 days of manual work at the minimum wage to all rural Indian households. Were these policies effective in reducing violence? Having identified structural breaks and the events which coincide with the breaks, we test if these events were effective in reducing violence using district-level violence data. We found that security improved at the border after the completion of the fence. While there were more insurgent casualties in border districts, civilian casualties in the area decreased after the completion of the fence. This suggests that security forces were perhaps better able to target insurgents, thereby reducing civilian deaths. The NREGS and PMPR programs were also effective in reducing insurgent and security force casualties. These results give support to our idea that there needs to be a certain level of security before development programs can work effectively. In the case of J&K, the construction of the fence improved the security environment, which allowed large-scale development programs to be implemented. The programs then further reduced violence, particularly that directed towards civilians. Suggested further reading: Kaila, H., Singhal, S. & Tuteja, D. (2018). Do fences make good neighbours? : Evidence from an insurgency in India. Households in Conflict Network Working Paper 287. This blog post was originally published at WIDER Angle, January 2019. S. Jessica Zhu is a Ph.D. candidate in the Department of Agricultural and Applied Economics at the University of Wisconsin – Madison. Despite the agriculture sector being one of the most important contributors to economic well-being in Sub-Saharan Africa (World Bank 2008, OECF-FAO 2016) and its persistently low agricultural productivity, smallholders in this region are unenthusiastic about modern technology, such as fertilizer, and keen on traditional technology, such as intercropping. This is a technology adoption puzzle: Why do African farmers not adopt modern technologies that economists believe should provide, on average, higher returns? At the same time, why do African farmers adopt traditional technologies that have been shown to be unprofitable? Mo Alloush is a Ph.D. candidate at the University of California, Davis. Nearly one in five adults is affected by psychological disorders every year. However, the role that psychological well-being plays when it comes to earnings and economic decision-making is not well understood partially because the likely bi-directionality makes estimating causal links using representative data difficult: psychological well-being can affect income and economic decision-making and, at the same time, economic well-being may play a role in determining one’s state of mental health. In addition to this, there is a dearth of representative data at the individual-level that has information on mental health and socio-economic variables, especially panel data. While this makes causal identification difficult, it makes the implications of this relationship all the more important: causal impacts in both directions could create a feedback loop between income (and by extension poverty) and psychological well-being that, if strong enough, has the potential to affect income dynamics and put individuals on vicious or virtuous cycles. Understanding this relationship may help explain prolonged poverty spells and low resilience to shocks, and it can pave the way to designing more effective poverty-alleviation programs. Esteban J. Quiñones is a Ph.D. candidate in the Department of Agricultural and Applied Economics at the University of Wisconsin-Madison and is a Trainee at the Center for Demography and Ecology. A growing literature highlights how climate events, such as extreme heat, hurricanes, and floods, shape migration (Gray and Mueller, 2012; Cattaneo and Peri, 2015; Jessoe, Manning, and Taylor, 2018). Nearly all of these studies restrict their attention to reactionary (ex post) responses to climate shocks, despite the widely held but rarely tested hypothesis that individuals and households also migrate in anticipation of future risks. The lack of research on anticipatory (ex ante) migration is likely due to the difficulty in distinguishing between ex ante and ex post phenomena. To my knowledge, Dillon, Mueller, and Salau (2013) is the only exception. In my job market paper, I explore whether individuals from rural, agricultural communities in Mexico migrate or reallocate local labor in anticipation of climate-induced crop losses. I develop an approach to credibly disentangle ex ante from ex post responses to temperature-induced catastrophic crop losses in order to assess how information spillovers associated with climate events in rural, agricultural communities influence migration and local labor decisions. Shiyi Zhang is a PhD student in Economics at Cornell University. Sergey Smirnov is a junior in the College of Arts and Sciences double majoring in Economics and Religious Studies. NEUDC 2018 hosted two sessions on Environment, Energy, and Resource Economics (EERE), as well as one on Climate Change and one on Conflict. Research in these topics both highlighted the vastness of these topics, as well as contributed to the literature with thoughtful and deep dives into issues ranging from children’s educational attainment in conflict zones to the causal effects of electrification on industrial development. Vasudha Mathur is a senior from New Delhi, studying Economics in the Cornell College of Arts and Sciences. Her primary focuses of study are education and developmental economics. Tumenkhusel Avirmed is a sophomore with concentrations in Economics and Development, pursuing dual degrees at Cornell in International Agriculture and Rural Development and Environmental Sustainability Science. Institutions and Political Economies was one of the most represented themes among the 168 papers presented at NEUDC. Research topics under this theme explored the long-term effects of historic regimes, as well as diverse political-economic issues for current regimes, including legislative issues, incentives, and regulation. Joanna Upton is a Research Associate in the Charles H. Dyson School of Applied Economics and Management – and also Co-Editor in Chief of the EconThatMatters blog. Food insecurity remains a pressing issue for the development economics community; while it was the topic of only one dedicated session at NEUDC this year, it was pervasive as a cross-cutting topic across nearly all themes.